This week is quite an emotional one for me... but I'll try and wade through the excessive nostalgic feels and turn this post into something productive, stick with me here. It's midsummer/summer solstice this week, the longest day of daylight in the northern hemisphere, and it also marks the one year anniversary of when I took a leap of faith and discovered pure, nonsensical, ecstatic euphoria -- my Wonderland. But of course, it was a very real place with very real people. My Wonderland is a city called Uppsala in Sweden where I stayed for 9 weeks last summer. It was a place that was strange and familiar at the same time, a place that instantly felt like home in a way no other place ever had before in my life. I can't believe it's been an entire year since I stayed there -- the scenery, the colors, the smells, the textures... they are all so fresh in my mind still. It was also the place that birthed the initial idea for this blog (hence the .se domain name.) Ever since I left it, I have felt like a huge chunk of my heart was also left there. I don't want Wonderland to be just an ephemeral dream, however surreal of a time it might have been in my life. I followed the white rabbit of impulsiveness last year, and found myself in the exact place I felt like I was always meant to be at. I'll be back there again, sooner or later. Preferably sooner than later. Now, shifting gears from recollection to the present: as memories of Uppsala toes the border between very real, and a very whimsical dream, I tried to take this Alice inspired outfit to a good whimsy level without it being too out of place in the real world -- it was a functional garden visiting outfit. 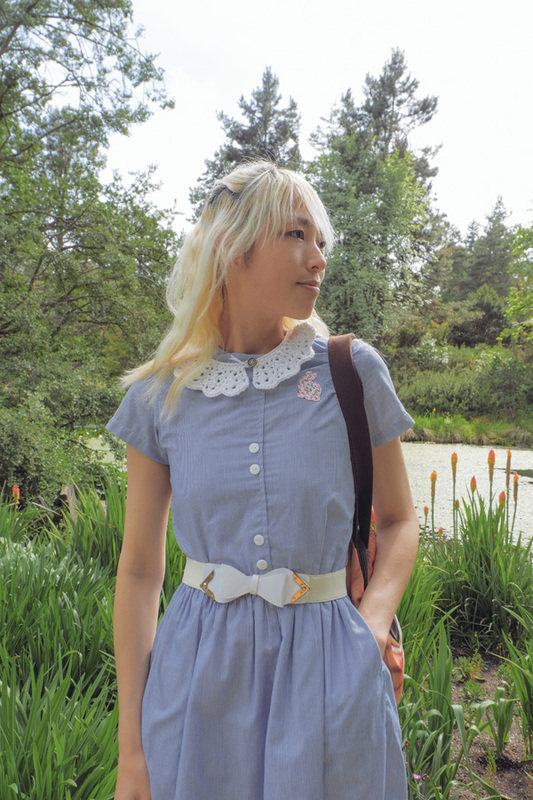 This dress was found at a thrift shop, and through a bit of curious Googling of its label, I found out that it was a school uniform from China... What a strange and long journey it must have been for it to end up here! We are all somewhere along our own strange journeys, continuously passing from one rabbit hole to another. While I might not be where I wish I was this year, there are a whole slew of different adventures to be a part of right where I am. And as summer goes on, I want to do more photo sets that straddle the fine line between fantastical dream and the here and now. Thanks to Meghan, we came up with a list of whimsical photo shoot ideas to explore -- most of these won't break the bank, they just require some smart dollar store scrounging. Will you try them too? Balloons in a bundle, one giant balloon by itself... As long as it floats, you've got a winner of a shoot! Sparklers at dawn/dusk... though let's be honest, I will never be awake enough for a dawn shoot unless the theme is zombies with very little motor skills. Streamers or ribbons: tie long ribbons to a stick and go wild making loops while twirling! 4 comments on "Finding Wonderland"
Eeee thank you! Sometimes I really get melancholic with nostalgia and have to remind myself to live in the present. I think scouting out locations to take photos really helps with that~ I agree -- there are some really nice places right here, but I can't stop my brain from always wanting to flyyyyy awayyyyy! I hope you're finding little havens in Portland! <3 <3 Thank you! That garden was HUGE and perfect. I'd stay there forever if I could!